The talk of recession has been topic of discussion for a few years now. After a lot of the larger corporate companies started downsizing there was a general fear among people that many Americans were going to end up jobless. Only very recently has the job market started to take something of a turn for the better, so a movie like The Company Men comes to theaters just in time to come off relevant. The film stars Ben Affleck as Bobby Walker, a regional sales manager of a company called GTX which specializes in ship building. From the start of the movie you get the sense of wealth that comes with working for a large corporation. Ben Affleck brings a sense of brash swaggering attitude you would expect from someone who works in such high pressure field. Within the first ten minutes Affleck's character finds out that he has lost his job along with a large number of fellow employees. Gene McClary (Tommy Lee Jones) is the executive VP of the company and is quite close with Affleck's character. Unfortunately at the time of his termination McClary is at a stockholders meeting discussing the next year's profits and not doing a very good job of it. Chris Cooper and Kevin Costner play supporting roles in the film as another employee of GTX and Ben Affleck's brother-in-law. As Walker begins the arduous task of job hunting he begins to realize that despite his experience and knowledge finding a job isn't as easy as he thinks. Along the way he struggles with the concept of having to let go of certain conveniences he has become accustomed to i.e. auto detailing, dry cleaning, big vacations, etc. His wife is willing to accept the realities of a smaller income and right from the start begins to make plans to do so unlike Affleck. As time passes and no jobs are hiring Walker swallows his pride and takes a job working with Costner doing carpentry. As much as he dislikes it, it allows him to keep his family fed and gives him some insight into what he should be focusing on in life. The overall tone of the film is somewhat dark as it deals with the realities of today's corporate and financial world. If you have paid any attention to what has been going on with large banks, and their CEO's than this movie will have a very familiar feel to you. It jumps back and forth between Ben Affleck's characters journey, his struggle to get himself back on his feet and Jones' character as he navigates a business world he no longer has any love for. The performances in the movie, while good, aren't anything that stand out. Even though you are shown how Walker's family has to struggle with his job loss you never totally feel that sense of tension or difficulty that the film implies. What you end up feeling is sadder for the older generation of men, such as Chris Cooper's character who eventually loses his job as well and is unable to deal with that transition. What works best for this movie is also what keeps it pinned down; excellent actors who are working with a movie that just can't seem to find the right groove. The Company Men is a decent movie with a good message about how backward the corporate world is and while it may not explode at the theaters; at least it won't die there either. 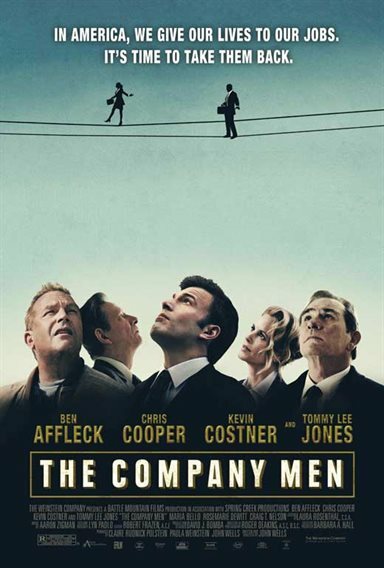 Download The Company Men from the iTunes Store in Digial HD. For more information about The Company Men visit the FlickDirect Movie Database.